The Grand Lodge of Massachusetts dates back to 1733 and Masons in the Bay State are rightfully proud of their nearly-300-year history. Historical interests played a large part in me submitting a petition to Morning Star Lodge in 2015, and it was evident from the beginning that history was very important to others there as well. Just after being initiated, I was proudly told by a Brother that our Lodge, chartered in 1793, was the oldest of the seven Lodges in the 23rdDistrict. I had heard that statement before and I had noted that some of the other local Lodges had been chartered in the 19thCentury, so I just accepted the fact at face value. That same week, I acquired a very old book pertaining to the history of Morning Star Lodge. I was surprised to see within the first few pages that Morning Star Lodge had actually been formed out of another pre-existing one, Trinity Lodge, which is still operating in the district today. The book listed Trinity Lodge as dating to 1778, yet their website displayed the year 1858. I casually mentioned the discrepancy to the District Deputy Grand Master at the time (and Past Master of Trinity Lodge), R.W. Gregory Stahl. He was well aware of the earlier 1778 date and it was something he had long been battling to restore. 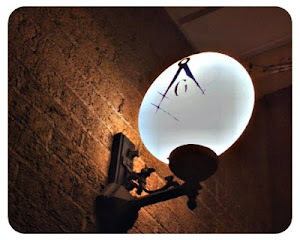 Like most other stories of a Lodge with two charters, the crux of the Trinity Lodge saga was the period of darkness in the wake of the Anti-Masonic sentiments in the 1820's. Trinity Lodge had indeed been formed on January 30, 1778 under the authority of M.W. 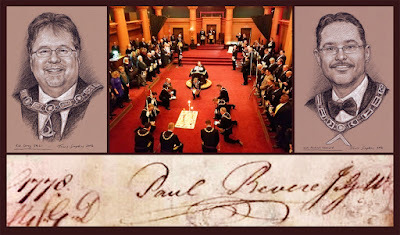 Joseph Webb and their original charter even bore the signature of Paul Revere, who was Junior Grand Warden at the time. The Lodge flourished for over four decades. Then, like so many others, they went dark in 1826 following the fervor of the Morgan Affair. 32 years later, Trinity Lodge re-formed and was granted a new charter on September 8, 1858. Morning Star Lodge, which had resumed in 1842, could produce their original 18th Century charter and was later re-granted their original 1793 date. The Trinity Lodge charter however, could not be located and the 1858 date stuck. Fast forward 150 years... In 2008, the Grand Master visited Trinity Lodge for the Sesquicentennial anniversary of the 1858 charter. R.W. Gregory Stahl pointed out a Master's Carpet dating to 1784, evidencing the true age of the Lodge. The Grand Master stated that if the original charter could be located, then Grand Lodge would be supportive of restoring the 1778 date. The hopeful search for the document continued. In 2016, with the diligent help of the Grand Historian, R.W. Walter Hunt, the original 18th Century Trinity Lodge charter (damaged, but still very legible) was located in the Grand Secretary's vault in Boston. Of all the Masonic events I have attended, the Trinity Lodge rededication ceremony held on January 30, 2018 was one of the most unique and memorable. It's something that doesn't happen often, and I'm not likely to witness anything quite like it ever again. The direct connection with history was palpable. The highly anticipated event was scheduled on the 240th Anniversary of the 1778 charter. The original fragile document, still clearly showing the signature of Paul Revere, was placed on display for all to see. A crowd of a hundred or so came out to the event, organized by Wor. Micheal Leonard, Past Master of Trinity Lodge, and the local news media took note. I personally enjoy attending the “public” events because I can bring my wife along, and she took the photo of the ceremony shown above, which was widely shared all over social media the following day. Travis Simpkins is a freelance artist with clients throughout the United States and Europe. He currently works on projects for the Supreme Council, 33°, NMJ in Lexington, Massachusetts. He also serves as a portrait artist for the Grand Lodge of Massachusetts, Grand Lodge of New Jersey and other jurisdictions across North America. His artwork is in many esteemed collections, including the Harry S. Truman Presidential Library & Museum in Independence, Missouri. Bro. Simpkins is a member of Morning Star Lodge A.F. & A.M. in Worcester, Massachusetts. He is a 32° Mason in the Ancient Accepted Scottish Rite- Valleys of Worcester and Boston. He is also a member of Eureka Royal Arch Chapter, Hiram Council of Royal & Select Master Masons and Worcester County Commandery No. 5, Knights Templar.